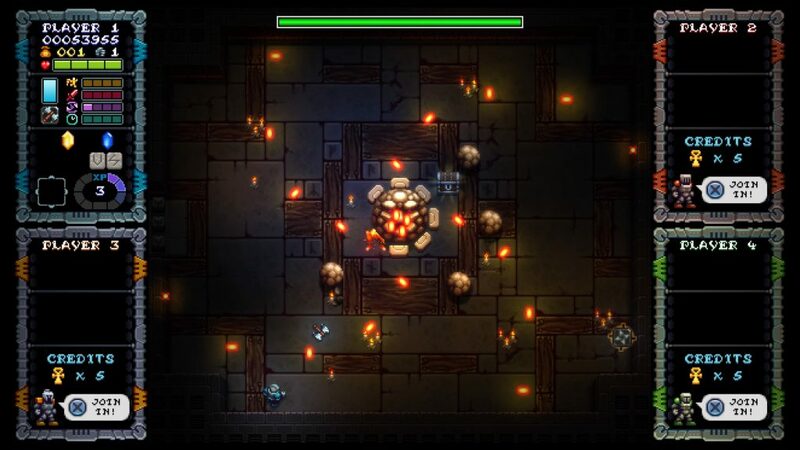 It’s so difficult to be enthusiastic about another twin-stick shooter, especially one that marries the two indie gaming cliches of ‘roguelike mechanics’ and ’16-bit graphics’ together but Iron Crypticle is here and offers up yet another helping of this now overpopulated sub-genre. You know the score by now. You (and up to three mates in local co-op) travel through the various levels shooting and looting your way through the various enemy hordes. There’s very little in the way of plot. Instead it is all about progression. 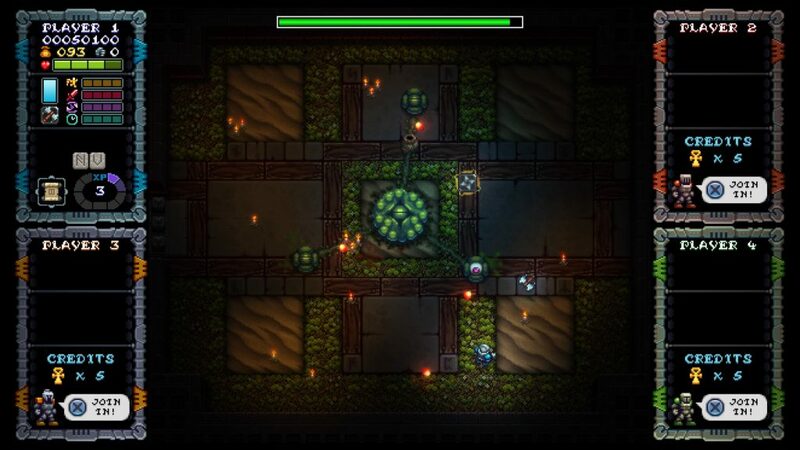 It is a roguelike, rather than a roguelite, which means that when you die, all your upgrades are lost. Although any weapons you discover will be unlocked from then on, meaning that you can find them in open play. The game itself is quite simple. It’s really about being accurate as you hold off the large number of enemies that approach you. You move with the left stick and you hold the right stick to aim and fire (no fire button required, which is a very good thing). Aside from the twin-stickery you also have a dash move for getting out of trouble, an Iron Fist attack (which clears a small circle around you) and scrolls which have various effects (such as sending out projectiles or shielding yourself). It’s reasonably straightforward although the scrolls are quite hard to identify. The first downside of the game is that you can only aim in eight directions which makes precise aiming difficult and can be a real problem when you are backed into a corner and need to be as efficient as possible with your firepower. It’s not gamebreaking but we’re not a fan of it. During the game you can collect coins which can be spent on upgrading your speed, damage, fire rate and weapon duration. Extra coins can be earned in a fun little 2D side-scrolling platform minigame but the opportunities to actually spend money are quite limited. There is a shopkeeper who turns up now and again on the map but you don’t get a major improvement when you buy upgrades. If you focus on scoring, and that’ll mean keeping your score combo going, you’ll level up your EXP which will increase your hit points. It’s a good risk vs. reward gameplay mechanic but after a while staying alive will have to be your primary focus. Visually the game has a reasonably authentic arcade game look. Imagine Ghosts ‘n’ Goblins but viewed from a Gauntlet kind of perspective and you’re pretty much there. It’s a nice enough look but some of the dungeons are dark enough that seeing what’s happening can be a problem. By design for sure, but it can be irritating when the game gets difficult and it will. 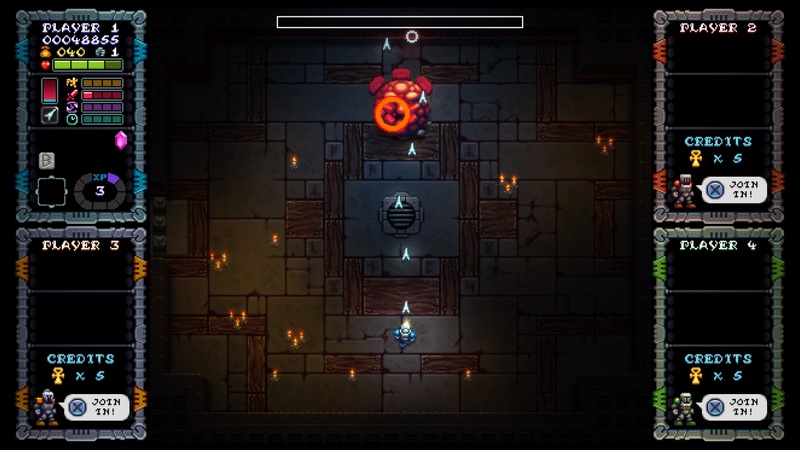 Iron Crypticle puts up a pretty stiff challenge, as you’d expect from this type of game. Beyond that, there’s not much else you can say. 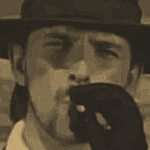 The roguelike stuff is okay, the combat is okay. Neither aspect excels but nor are they poorly executed. In a world where Nex Machina exists, it’s hard to ask you to consider this game. However, if you’re a fan of the genre this is a reasonable example of it. 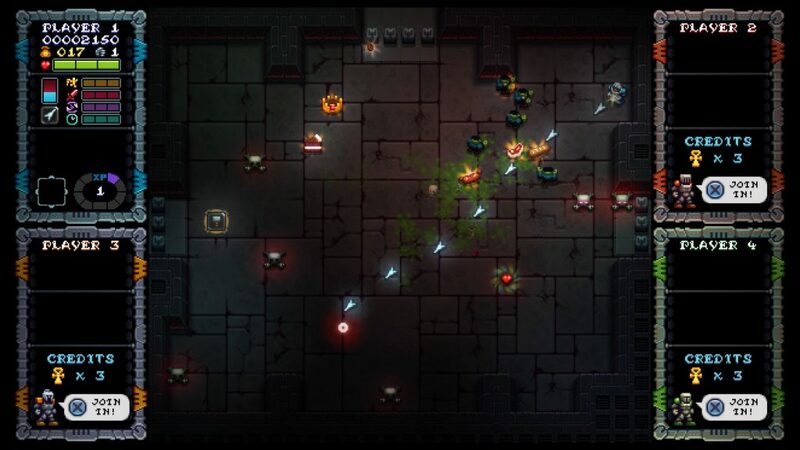 If you're bored of Nex Machina but not bored of the twin-stick shooters with roguelike elements, then Iron Crypticle is worth a look but it doesn't offer anything to advance the genre.